My breakfast of choice seems to always involve bread or a pastry of some kind. Overall, I'm a pretty healthy eater but I've been in a breakfast slump lately. Those who know me well can tell you how much I love frozen drinks like smoothies and icees/slurpies/whatever you want to call them. I finally got intentional about coming up with a healthy breakfast that I could look forward to. 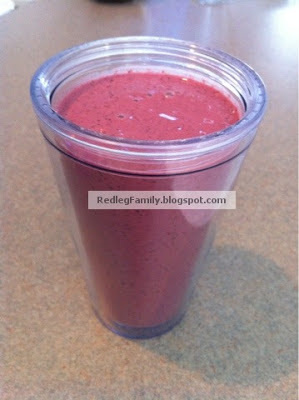 Enter my Berry Super Smoothie! Just throw it all in the blender and puree. Even my girls love sneaking sips of my smoothie! 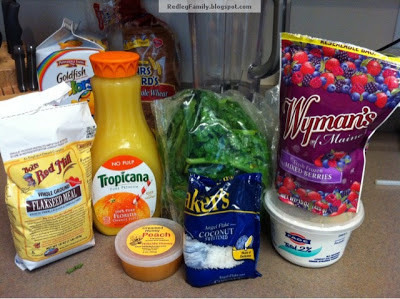 Here is the approximate nutrition info for the smoothie using the 1/2 cup measurements. Some of the biggest benefits of this smoothie can't be found in the numbers above. Greek yogurt is a good source of protein, calcium and probiotics, which improve your digestive health and immune system. Frozen berries are a great source of Vitamin C and antioxidants. Spinach also provides you with many great antioxidants including those that fight cancer! One cup gives you more than your recommended daily allowance of vitamins K and A, and almost all the manganese and folate you need. Local honey, when eaten daily, is known to help with seasonal allergies. Ground flaxseed meal is an excellent source of Omega 3 fatty acids, lignans, and insoluble and soluble fiber. These components may be able to help protect against cancer, cardiovascular disease, diabetes, inflammation and hot flashes. Orange juice is another great source of Vitamin C and can protect against inflammation, improve diastolic blood pressure and decrease LDL (bad) cholesterol levels.